The UNRWA is on the front lines of the Hamas War in Gaza. In the headlines, its schools are forever being fired on or found to be stockpiling rockets. If individual Gazans are being used as human shields, the UNRWA often seems as if it is one big organizational human shield. But the UNRWA isn't Hamas' human shield. The UNRWA is Hamas. The "UN" part of the UNRWA, the blue logos and symbols, fool us into thinking of it as an international humanitarian organization. But the UNRWA in Gaza functions as a large Palestinian Arab organization with a smattering of foreign supervisory staff. And those foreign staffers often tend to leave during a conflict. The UNRWA is not an international organization operating in the Middle East. Effectively it's a local Arab Muslim organization funded and regulated internationally. Since the UNRWA classifies 80% of Gazans as "refugees", it administers the biggest welfare state in the world on their behalf. Like the Palestinian Authority, the UNRWA's welfare state is run locally and funded internationally. The UNRWA is the biggest employer in the West Bank and Gaza after the Palestinian Authority and the vast majority of its employees are "locally recruited". Varying figures place the share of local employees at between 90 and 99 percent. Even though there are more Arab Muslims living in the West Bank than in Gaza, there are more "official" refugees in Gaza, which means that more UNRWA funding and efforts are directed there. The UNRWA only runs 96 schools in the West Bank, but it runs 245 schools in Gaza. It employs less than 3,000 education staffers in the West Bank, but over 10,000 in Gaza. Why does Hamas, which is obsessed with brainwashing the next generation into martyrdom, allow a foreign organization to run an educational system for 232,000 pupils? It's because in Gaza, Hamas and the UNRWA are the same thing. 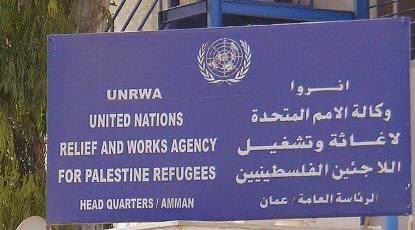 The UNRWA's Gaza staff has its own union. In the 2012 election, a pro-Hamas bloc won the support of most of the union with 25 out of 27 seats on a union board. When there was talk of reforming the UNRWA by removing Hamas members from its ranks, the editor of a Hamas paper wrote that, "Laying off the agency employees because of their political affiliation means laying off all the employees of the aid agency, because…they are all members of the ‘resistance,’ in its various forms." The official word from Hamas was that it and the UNRWA are the same thing. The UNRWA's vast majority of locally sourced Gazans are part of Hamas. The UNRWA does not see that as a problem. "I am sure that there are Hamas members on the UNRWA payroll," a former UNRWA Commissioner General said, "and I don’t see that as a crime." "Hamas as a political organization does not mean that every member is a militant, and we do not do political vetting and exclude people from one persuasion as against another," he said. Also if the UNRWA fired Hamas members from its Gaza staff, it would have no one left. Hamas control over the UNRWA in Gaza is reflected in the schools which promote Islamic terrorism. It's unsurprising that UNRWA schools have repeatedly become flashpoints in conflicts between Israel and Hamas. The members of the Islamic terrorist group aren't invading UNRWA schools to use them as human shields. The UNRWA schools are Hamas bases of recruitment and operation. The current accusations and counter-accusations over attacks on and from UNRWA schools are a reenactment of the same set of events taking place in 2009. Only the locations and the names have changed. The same headlines, “Israeli shelling kills dozens at UN school in Gaza,” and “Massacre of Innocents as UN school is shelled” are repeating all over again. Then, as now, Hamas launched attacks on Israeli forces from around a UNRWA school. Then it turned out that the attack had happened outside the school and no one had actually died inside the school. Nothing has changed since then. The "massacres" in which Hamas terrorists using UNRWA schools as a base are killed pop up in every paper. The UNRWA repeats the same lies. Then it "discovers" Hamas rockets in three of its schools. And that's just the tip of the iceberg because every UNRWA school is a Hamas school. The UNRWA has admitted that Hamas uses its schools to store rockets. It admits that it has Hamas members in its ranks. It admits that rockets have been fired "into Israel from the vicinity of UN facilities and residential areas." What it refuses to admit is that it should in any way be held accountable for functioning as an arm of a terrorist organization. If an organization consists largely of Hamas members who use it pursue Hamas goals, then the organization is Hamas. Hamas use of the UNRWA as its public face is a war crime, but terrorists commit war crimes without a second thought. But the UN and the UNRWA are complicit in the war crime by allowing Hamas to go on exploiting the UN brand. It's unfortunately commonplace for humanitarian organizations in war zones to collaborate with terrorists and guerrillas in one form or another. But the UNRWA isn't just paying money to Hamas in exchange for being allowed to operate, the way that many groups in war zones do, it has allowed Hamas to turn its operations in Gaza into an extension of the terrorist group. Hamas is listed as a Foreign Terrorist Organization. It's against the law for the United States to fund it. By funding the UNRWA, the United States is paying Hamas and participating in its war crimes. Using civilian and humanitarian facilities for military purposes is a war crime. Using them to stage attacks against civilians by attackers out of uniform adds further crimes to the total. The United States provided $130 million to the UNRWA in 2013.The UNRWA's continued operations in Gaza would not be viable without American funding. Congressional investigations and condemnations have led to nothing. The UNRWA has adopted neutrality policies, but it has refused to put up a firewall between it and Hamas. And it can't, because it has become an arm of Hamas. When Kerry visited Gaza in 2009, the UNRWA's Gaza chief passed along a letter to him from Hamas. The incident showed that not only was the locally recruited staff working for Hamas, but the UNRWA leadership was clearly cooperating with the terrorist group. The original "refugees" that the UNRWA was set up to cater to are for the most part dead. 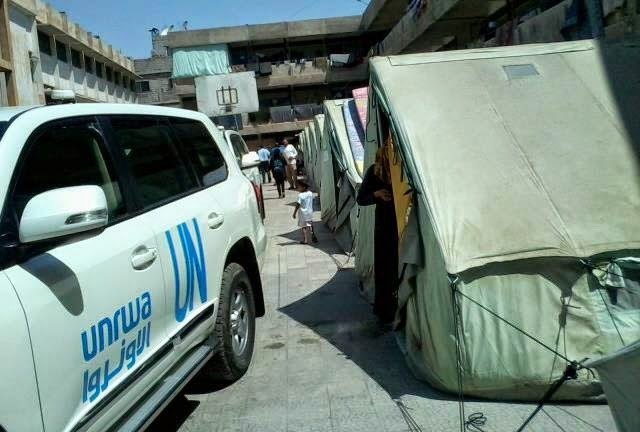 The UNRWA has become another UN boondoggle funding a welfare state for "refugee camps" that are older, bigger and more developed than many Middle Eastern cities. Meanwhile the UNRWA has become the public face of Hamas. UNRWA staff act as terrorists when they use UNRWA facilities for military purposes, but then switch back to UNRWA when Israel fights back. Hamas carries out attacks. The UNRWA demands ceasefires. Hamas uses UNRWA schools and the UNRWA denounces Israel when an attack happens. The UNRWA has become the mask that Hamas wears. It's a tactical asset for a terrorist group that empowers its human shield strategy. The UNRWA is not only endangering Israeli civilians, but it is also endangering Gazans who are exploited as human shields by members of a terrorist group masquerading as the staff of an international humanitarian organization. This issue has come up before and the UNRWA's long record of evasions and denials, admitting the substance of the claims about the Hamas takeover of the UNRWA, while insisting that its Hamas members are neutral and that all the rocket stores and rocket attacks around UNRWA facilities are unrelated to the Hamas members on its staff, are not good enough anymore. It's time to defund the UNRWA. UNRWA apologists will insist that without it, Hamas will have full control over the educational and social services of Gaza. But Hamas already controls those things through the UNRWA while using American taxpayer money to spread hate and promote terrorism. Hamas would not tolerate an outside organization controlling education in Gaza. The only reason it tolerates the UNRWA because it can use its people in the schools while the UNRWA funds the whole thing with American and European money. The moment the UNRWA is defunded, Hamas will kick it out and the same teachers will go on teaching the same hateful material, but without the UN logos. The United States should not be in the business of funding the corruption of young minds. Money should not be taken from American schools to fund the spread of hatred and terrorism. Bills have been filed and investigations have been launched. Congressmen and Senators have looked into the UNRWA, clucked their tongues and denounced its practices, but now it's time to take action by defunding the UNRWA. Obama and his whole administration are collaborating with Islamic terrorists. The only way to defund Hamas on Obama's watch is to remove this administration from a position of power. I suppose that's one way to go. My way is just call them out as Hamas fighters and shoot at them just like any other rocket firing terrorist. The big idea is Outsourcing Outrage comfortably. Investing in Hamas keeps the wannabes´ business going from Moscow to Washigton and provides a narrative of compassion to much despised politicians. I´m sorry for Israel. This is the time to defang Hamas. Hamas and their supporters have no honor or shame. Israel needs to put Israel first. Peggy Noonan had an excellent column in this last weekend's WSJ. She pointed out that we are dividing into two Americas. One America stands to be the light of the world, and stands fir the other lights. The other America is a non-thinking, subjective, emotive blob that sides with what it feels is the "underdog," viewing reality as a reflection of the movies. Watch enough movies depicting innocent Ewoks being slaughtered by Imperial Stormtroopers, I guarantee you'll think the guys with all the firepower are evil, regardless of value/moral/ethical distinction. Leftists of all varieties are children who devalue the lives of other children. "One America stands to be the light of the world, and stands fir the other lights." Simply put, that other light is darkness. What kind of leader says we can forgive them for killing our children? Golda Meir and any leader who holds such a view should be thrown out. Such a view is Israel's shame and undoing. Israel must learn to put its children first or else it is complicit with its enemies. UNRWA is a subsidiary organ of the United Nations General Assembly and its mandate is renewed every three years. It is the largest agency of the United Nations, employing over 25,000 staff, 99% of which are locally recruited Palestinians. In Gaza it must be 100%. ""To turn the other cheek is not a Jewish concept. Do not listen to the soothing anesthesia of the establishment. They walk in the paths of those whose timidity helped bury our brothers and sisters less than thirty years ago." 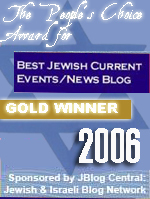 Did Golda Meir contradict what Kahane said? Who is right? In politics, in things grand, people end up believing their own lies more than a little. The UN was set up when the United States was the only global power. The claim was that it was international, and it was well intended, but it always reflected the cultural views of Western Europe and the United States. But now with non European, not Western Culture countries doing a little better, our cultural grip on the UN is starting to fall away. As such it no longer serves our interests. The solution is not to expect it is going to reform (to our liking). That is unlikely. What we can do is to start withdrawing support, both funding and political backing. Israel should withdraw from the UN entirely. the country will still have the support of her allies but wouldn't have to endure the humiliating and fruitless theatrical productions ie. 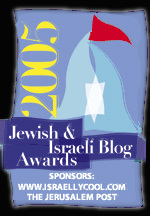 hasbara. The US should withdraw from the UN and ask the UN to leave the US.